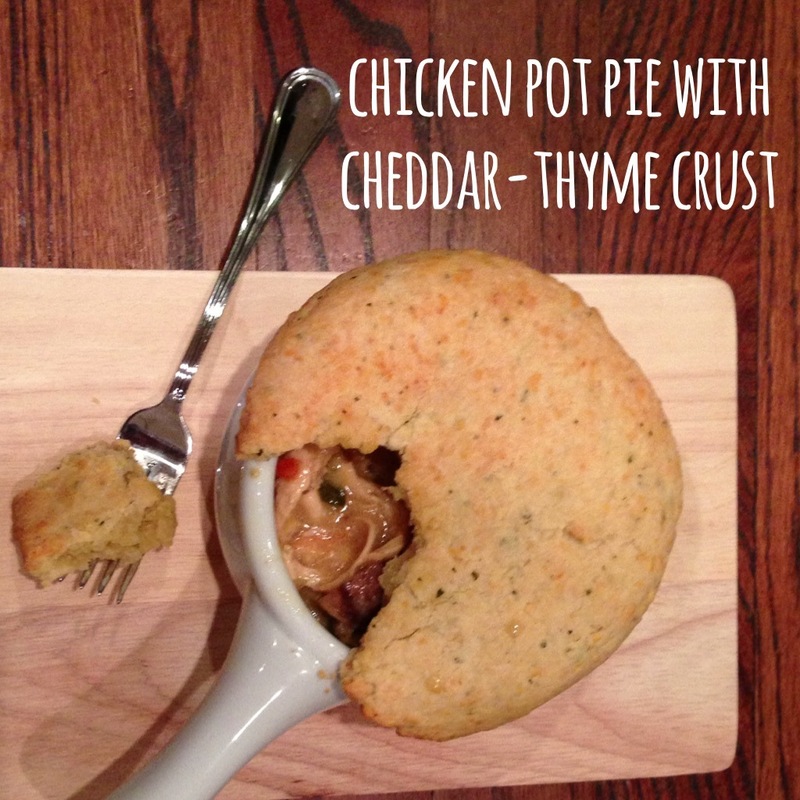 chicken pot pie with cheddar-thyme crust | Is there any wine left? Most of my girlfriends from growing up are spread out around the country – from San Francisco on one coast to Charleston and D.C. on the other. Sometimes we go a year or two between visits, and it really makes me sad not to have them in my day-to-day life. In between my best friend Court having her first baby and becoming pregnant with her second, we had one of those long, wonderful evenings filled with wine and catching up and laughter and more wine. But women cannot survive on wine and love alone. We also shared an amazing chicken pot pie that night. As soon as I got back to Houston, I set about trying to recreate it. I think what I really wanted was to recreate our time together and to combat the longing to be nearer each other, of course. But this warm, comforting pot pie is a pretty close second. Melt the butter in a large dutch oven and add the olive oil. Turn the heat to medium-high and place two of the chicken breasts in the pot when the butter begins to bubble. Cook the chicken for 5 minutes then flip and cook the other side for 5 more minutes. Remove to a plate then add the other two chicken breasts and cook for 5 minutes per side. Remove the remaining pieces of chicken to the plate. Lower the heat to medium-low and add the carrots, onion, and celery. Sauté for 7-8 minutes, until translucent and slightly browned, then add the mushrooms and garlic. Cook for 5 more minutes. Add 3 tbsp. flour and the salt, pepper, cayenne and paprika, stirring until the flour and seasonings are absorbed then stir in the wine and scrape up the brown bits on the bottom of the pot. Cook for 2 minutes then add the chicken broth. Add the chicken back to the pot and stir in the thyme. Bring to a boil and lower to simmer. Cook for 45 minutes, stirring every 10 minutes or so. Remove the chicken from the pot and set aside. In a small bowl, combine the egg yolks, heavy cream, and last tbsp. flour. Whisk in 2 tbsp. of the vegetable and chicken sauce to temper it, then add the egg mixture to the dutch oven and quickly whisk it in until just combined. Cook for 5-10 more minutes. Remove the chicken from the bones and shred. Add it back to the thickened sauce. Stir and taste for seasonings. Add more salt and pepper if necessary. Turn the mixture out into a bowl and press into a ball. Wrap the dough in plastic wrap and place in the refrigerator for an hour. Fill 8 individual crocks with the chicken mixture or pour it into a 9″x13″ dish. Roll out the dough to 1/4″ thickness. Either cut in into 8 rounds to place on top of the crocks or roll it in one rectangle to place on top of the baking dish. Cook at 350 degrees F for 15-18 minutes, until the crust is golden brown. Remove from the oven and let it sit for 10 minutes before serving.